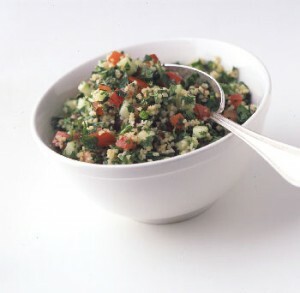 My version of tabbouleh uses one of my favorites grains ( I call it a grain, but it’s actually a seed), quinoa, instead of the traditional ingredient, bulgur wheat. Not only do I prefer the taste of quinoa, it is also gluten free and far more nutritious! It’s very high in protein (12%–18%); and, unlike wheat or rice (which are low in lysine), quinoa contains a balanced set of essential amino acids, making it an unusually complete protein source among plant foods. It’s a good source of dietary fiber and phosphorus and is also high in magnesium and iron. I use it in place of many gluten products and our whole family loves the taste! I’ve used red, white, and black quinoa (you can mix them too). I consider the colors of the food I’m making before choosing which color grain to use (presentation counts! ), but the red and black, which are a bit more expensive, have a tastier nutty flavor (and I’ve heard they are higher in protein). Soak quinoa for 15 minutes in hot water. Drain and rinse well while moving fingers through quinoa to remove the saponin, the protective, bitter outer layer. Add 1 C. water to 1 C. quinoa. Bring to a boil, cover, and simmer on low for 15-20 minutes. Fluff with a fork and let cool. If you’re in a hurry, rinse with cool water before adding to salad. Mix all ingredients together and enjoy! I only recommend Young Living essential oils, since their therapeutic grade quality makes them safe for ingestion. Do not take lower quality oils internally, as they may be toxic! Know your product! For information on the starter kit I recommend, and how you can get a gift from me, click here.